French Toast is a tasty quick fix for the breakfast. 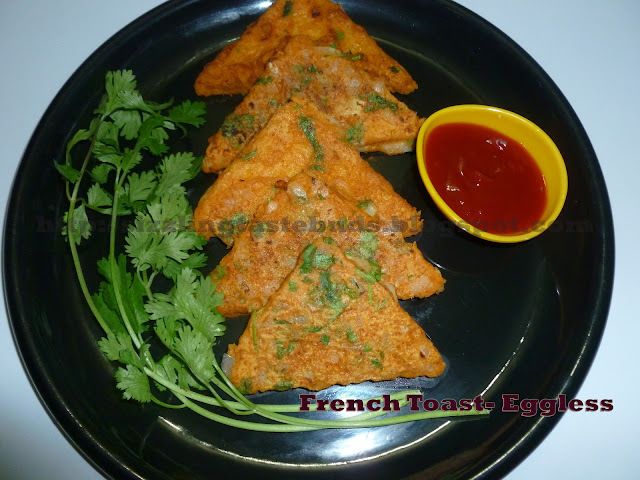 Usually French toast is made of egg and milk but this is an eggless version and for all those vegetarians who consider egg to be a non-vegetarian, I am sure you will surely like this. Eggless french toast is prepared with masaledar chickpeas flour. This can even be served as an evening snack with some tomato ketchup and kids will love it. 1. Trim the edges of the bread slices and keep aside. 2. Prepare the batter with chickpeas flour, red chilli powder, jeera powder, salt, chopped onions with enough water to get a thin batter. 3. Dip a bread slice into the prepared batter and coat it with the batter. Place it on a greased heated tava and cook for a minute in a low-medium heat. Flip it and cook the another side too.